When I was in college, each year there was one movie that got watched over and over again in the dorms, to the point that I never wanted to see it again. My freshman year, that movie was Shrek. My sophomore year, that movie was Pirates of the Caribbean. Now, some ten years later, I can look back fondly on those times in the dorm together with friends (even if I’m not keen to watch those movies again). And despite not wanting to watch Pirates again, piratey games are definitely not off limits. Does Libertalia deliver the goods (and then plunder them)? Find out below! 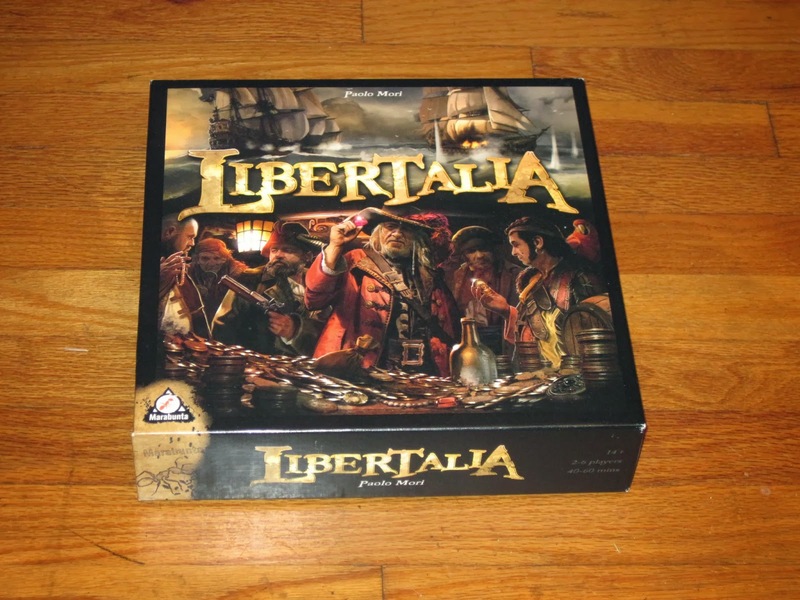 Libertalia is a role-selection/auction game for two to six players. Players are pirate captains dividing the booty of raided ships over three campaigns. 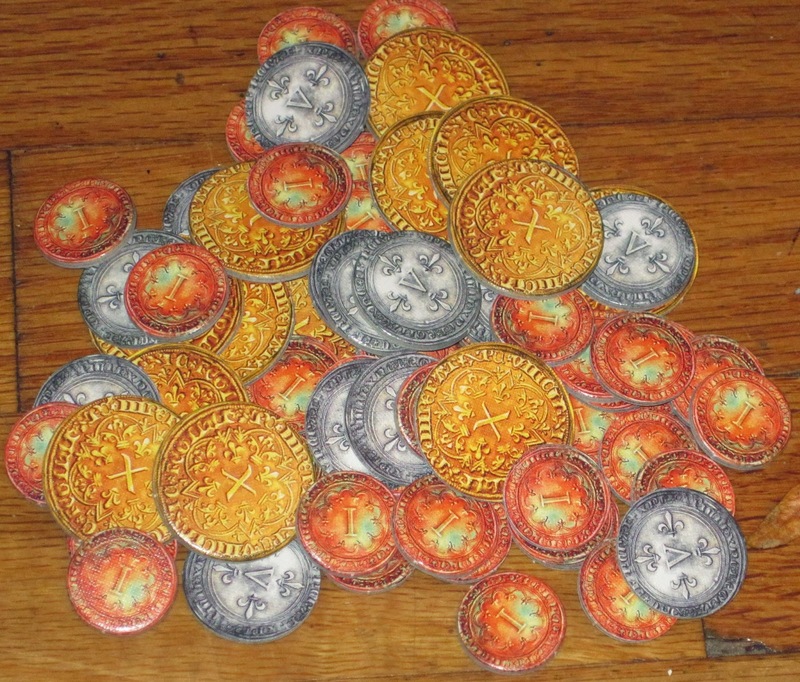 The player with the most doubloons at the end of three campaigns wins. 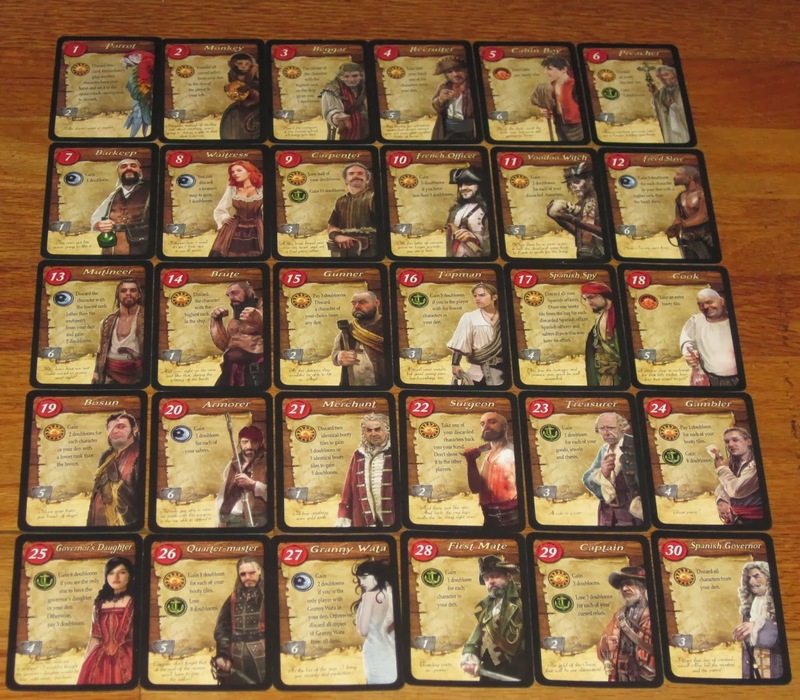 At the start of the game, each player receives an almost-identical deck of thirty different role cards. Each role card has a rank (a number 1-30), a special ability, and a tiebreaker number. (The decks only differ in tiebreaker numbers.) At the start of the first round, one player shuffles his or her deck of role cards and reveals nine. All players remove these nine cards from their decks to form their hands. The ship board, loaded with booty for four players. 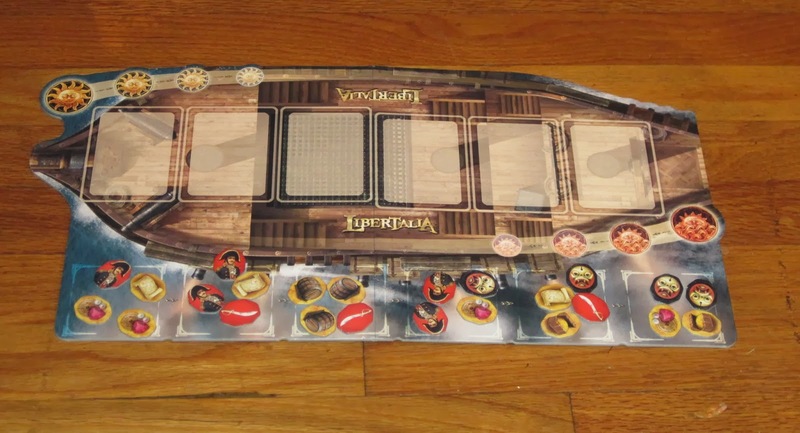 In addition to this setup, each player receives ten doubloons, and one booty tile for each player in the game is placed on each of the six booty compartments on the ship board. Each campaign has six days of raiding, followed by one day of rest, when scores are tabulated and recorded. At the start of each day, each player secretly and simultaneously chooses one role card from their hand. Once everyone has chosen, the roles are revealed and arranged on the ship board by rank, from low to high, and by tiebreaker number (if there are any ties). Then, in ascending order of rank, each card activates its sunrise ability. Once that is finished, in descending rank order, players activate any dusk abilities and choose one booty tile from that day’s hold, placing the tile and the character in their dens. 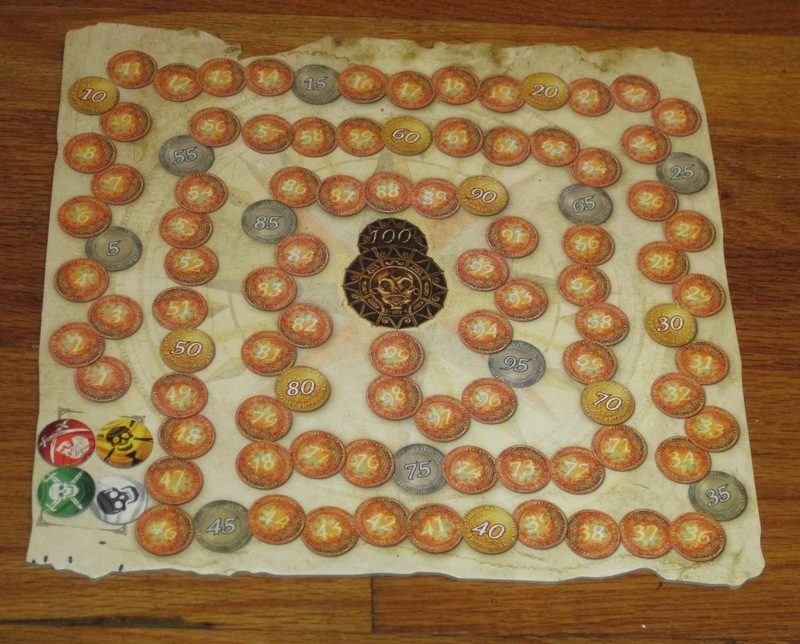 Booty tiles grant either doubloons, the ability to kill other players’ characters, Spanish officers (who kill the character who chooses them), treasure maps (worth nothing except in sets of three), or cursed relics (which take away doubloons). Finally, at the end of the day, any nighttime abilities in each player’s den activate. This happens six times. On the day of rest, any anchor abilities are resolved first, then players calculate their total doubloons and record this amount on the score track. 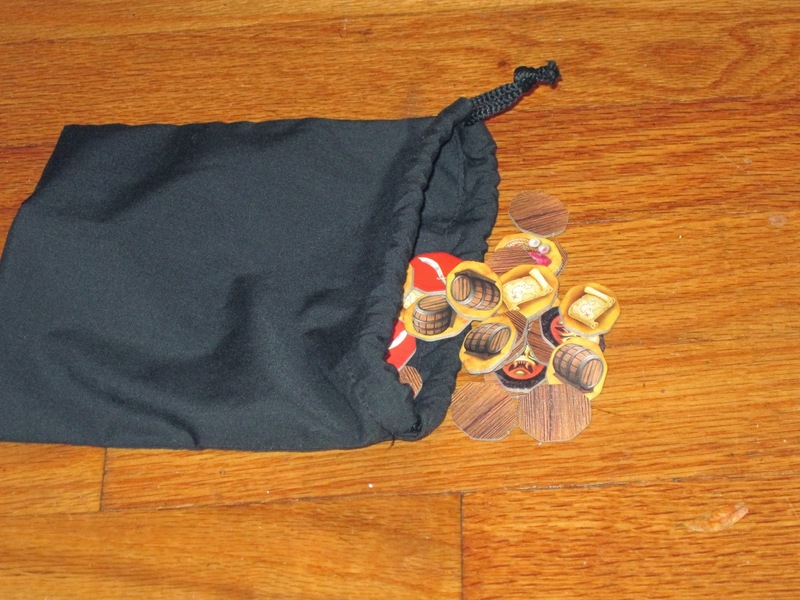 The booty tiles are returned to the bag, players return all doubloons but ten, characters in players’ dens and discard piles are removed from the game, and play continues, with new booty tiles added to the ship. At the start of the next two campaigns, the player who shuffled his or her deck reveals six more roles, which all players add to their hands. At the end of the third campaign, the player with the most doubloons wins. High Seas or Low Tide? It’s not often that one game completely supplants another in my affections. There’s room in my heart for all three members of Knizia’s auction trilogy, for Rialto and Bruges, for Acquire and other stock games, and so on. But Libertalia? This game has made Citadels obsolete in my collection. Libertalia is one of the most fun games I’ve played in a while. It combines the second-stage auction mechanic from For Sale with the interactive, simultaneous role-selection of Mission: Red Planet (and close relative Citadels) into a cohesive, engaging, and thoroughly thematic whole. 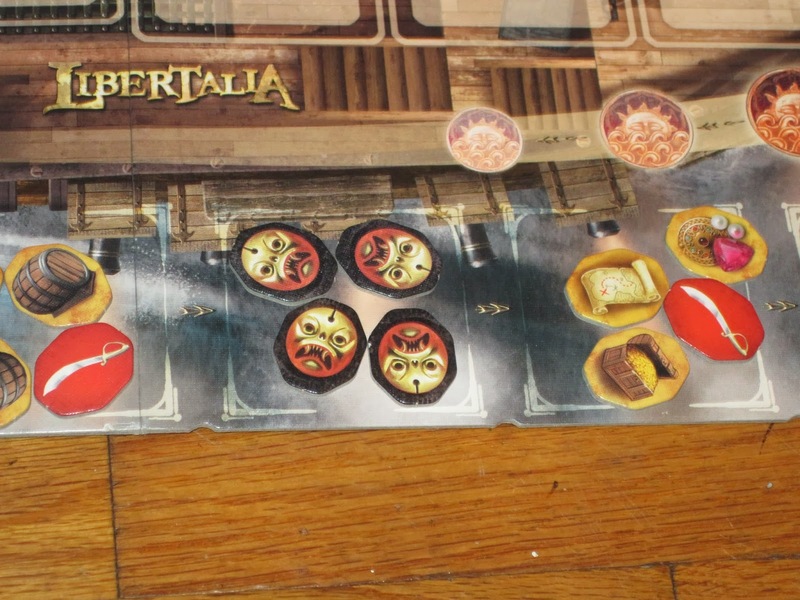 Yet despite borrowing some mechanics from other games, Libertalia stands on its own. All thirty role cards in the red deck. One of the ways Libertalia differentiates itself is in the roles available for selection. First of all, there are thirty possible roles, and a role in the game is generally used only once, meaning that there is a lot of variety for a role selection game. In any given game, only twenty-one of the game’s included thirty roles are used (9+6+6). This may seem like a large proportion of the deck (and it is), but the order in which the roles are added to players’ hands matters. For example, the Mutineer kills another character in the player’s den each night. 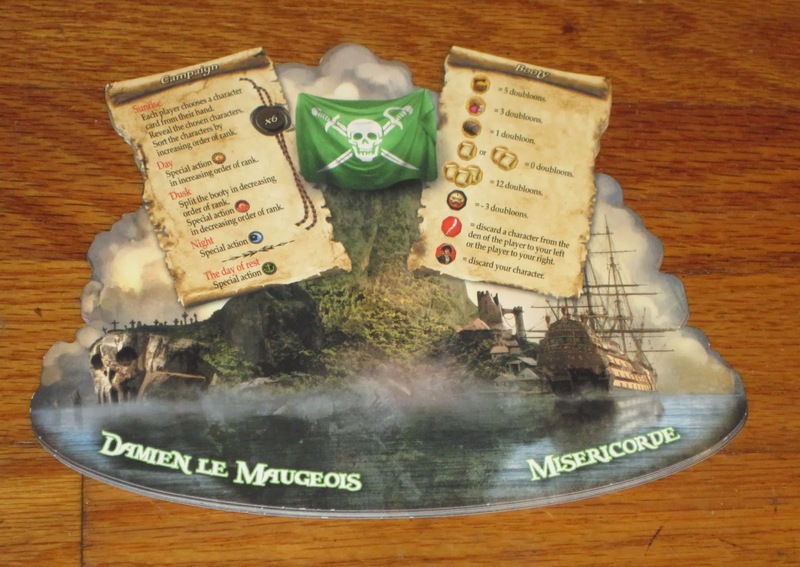 This may not be very good with the Barkeep, Granny Wata, or Waitress (each of whom provide nighttime benefits to the player turn after turn), but the Mutineer works very well with the Quartermaster (who gives a one-time benefit but suffers an eight-doubloon penalty if he survives to the end of the week) or the Voodoo Witch (who gives coins based on how many of a player’s characters are dead). But it’s not just the characters’ abilities that matters; their rank matters as well, as characters with a higher rank choose their spoils first. This obviously matters on a ship with only one treasure chest and the rest curses. Playing high or low rank may seem to be a straightforward decision: if the loot is bad, choose a higher-rank character to get the better portion. But things aren’t so simple in Libertalia. Certain roles affect both the order on the ship and can negatively affect either the bottom or the top of the ranks. The Brute, for example, kills the character with the highest rank on the ship. The Beggar takes three doubloons from the character with the highest rank, and it’s not unheard of for multiple Beggars to appear at once. And some booty, the sabers and Spanish officers, kill certain characters. Drafting early or late may protect or expose a player to danger, as only characters alive in a player’s den perform their nighttime or anchor abilities. Libertalia is very much a social game. Players must attempt to read what other players are doing. There is a good deal of player reading involved in deciding what to play–should you try for the top spot in dividing the spoils this day or another? What does your opponent think you’re doing–and how can you manipulate that to your advantage? Players must consider these things as they play their roles, yes, but there are many other situations when players must attempt to read each other as well. I’ll give one example. In a recent game I played, I had three characters in my discard pile–Granny Wata (who is very powerful if you’re the only player to have her), Monkey (who passes cursed booty tokens to the player on the left), and someone else I can’t remember. I played my Surgeon, who allowed me to take one discarded character back into my hand. My opponent to the left was certain I had chosen Granny Wata. After all, everyone else’s Grannies were dead, and a lone Granny is powerful indeed. He waited and waited for my Granny to show up, and he had a smug smile because he knew the player to my right had saved her Monkey to hand me all of her curses at the end. Well, in the very last round of the game, there were two monkeys on that ship, and mine was higher by tiebreaker. I handed my opponent all of my and the other player’s curses, placing me (just barely) in the winning position. Booty tiles. What’s coming up next? Libertalia is full of these surprises and upsets, which makes every card play and interaction exciting. It’s not uncommon for groans or cheers to erupt around the table because players can never know with one hundred percent certainty what the other players are doing. They are never without options themselves (always having at least three roles to choose from), so there is always room for bluffing and clever play. 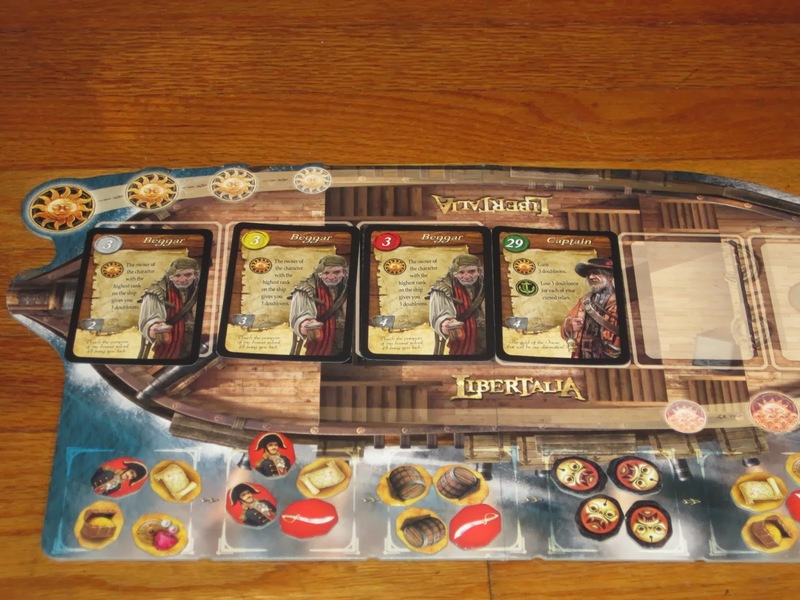 Libertalia, despite the words on the cards, is great for casual players and hobbyists alike. There is enough strategy for the latter (without offering enough certainty to bog down the game with long consideration), but enough engaging gameplay elements to keep the former engrossed. The simultaneous play moves the game along quickly, and the theme works very well. The game very much feels in line with the Pirates of the Caribbean movies, with all of the shifting alliances, convoluted plotlines, and bluffing antics. It helps that the theme is so present in the game. Some games can easily be transported from one thematic setting to another (see: Spyrium). Libertalia is so tightly married to its theme that it’s difficult (if not impossible) for me to imagine it in another setting. What helps in this category is the components. The artwork throughout, the thick cardboard doubloons, the booty tokens, the scoreboard–everything looks fantastic, and it feels that way too. One note of caution: while the game is not gruesome, some of the cards may be disturbing to younger players. The Surgeon’s shirt is covered in blood, the Voodoo Witch is a bit scary looking, and the Mutineer’s ability to kill other members of the ship’s crew could make some players uncomfortable. It’s nothing excessive, and it fits with the theme. Of course, because of the reading involved, this game seems better suited for older children and above anyway. Not a great day for treasure. I’ll mention a few other things. First, while the rulebook is clear on the gameplay, some of the card abilities are a bit hazy upon first read. (The BGG forums can be helpful here.) A supplement would have been nice. Second, the game’s box lists 2-6 players. While I suppose it’s possible to play with two or three, I think four or five is the sweet spot. Then there are enough players to keep the game decisions from becoming rote, and still enough decision space to reward good choices and punish bad ones. The player dens double as player aids. These are super helpful for new players. I mentioned at the start of this review that Libertalia has completely replaced Citadels for me. I recognize that the games are quite different–Citadels has eight or nine role cards that are used each round and are drafted from a common pool, and the gameplay beyond the role selection is city building, not auctions or set collection. But really, Libertalia and Citadels scratch similar itches. Anybody playing Citadels for its city building needs to find a different game, stat. The interesting bit about the game is the role selection, full stop. And while it’s true that the common-pool draft of Citadels is a neat idea, in practice it has always gone a little slow for my groups, especially when playing with new players. They have to read the cards, consider what to do, and then pass the cards to the left for the next player to do the same. Libertalia has much less downtime–all players can read their cards at the same time–greater variety, and a more interesting game underneath. The only thing still in Citadels’ favor with me is that it comes in a smaller package. But even Libertalia’s game time consistently beats Citadels’: it can handle six new players, with a rules explanation, in under an hour. In case you didn’t get this from the rest of the review, I think Libertalia is a fantastic game. It’s fun, it’s fast, it has good tension and decision points, it’s kind to new players without insulting experienced ones, it has variety, and it has theme to spare. The only things I can say against it are matters of taste. Some players will find it random or chaotic (those who aren’t very good at reading their opponents especially), some card combos will be situationally less interesting, and the tiebreaking system may be a turn-off to some players. There aren’t many games I would recommend for every gamer to have, and I’m not sure Libertalia would fall quite in that category anyway. But it’s close. Great review! Like you, I love Libertalia. I think you said it well here: “it’s kind to new players without insulting experienced ones”. It takes less than 5 minutes to explain the rules, which is great. You’re right that the teaching time is so short, which baffled me the first time I taught it. I thought the “words on cards” effect would slow the game down, but players caught on super fast. The simultaneous play and uncertainty of the game state help keep the game moving. Love it. Count me in as one who feels the tie-breaker system is broken. One of the monkeys is always the ‘best monkey,’ for example, getting to go last and passing on whatever curses the other weaker monkeys may have just thrown the player’s way. It was nice for you that you had the better monkey in your example, but it is pretty unfair to the player with the weaker one. I haven’t decided on my favorite alternate tiebreaker to use, yet, but I do always use one. I enjoy the game a lot otherwise.